GCA Altium acted as exclusive financial advisor to Cawood Scientific, the UK’s largest provider of independent agri-testing data and services for the land-based industries, on its secondary buy-out with Inflexion to support its next phase of growth. Founded over 25 years ago and headquartered in Berkshire, UK, Cawood offers a multi-disciplinary analytical testing service into the arable, livestock and environmental sectors. Cawood serves over 3,500 customers across three divisions, NRM Laboratories, Sciantec Analytical Services and Sci-Tech Laboratories. Cawood’s growth is underpinned by strong market tailwinds as food quality assurance and agricultural efficiency are increasingly part of the political agenda. The company positions itself at the forefront of developments in the agricultural sector as testing and data analytics play a key role in quality control and the sustainability of food production. In December 2010, Managing Director Nigel Patrick and Operations Director Linda Radnor undertook a management buy-out, supported by NVM Private Equity. Since then, Lord Curry of Kirkharle joined as Chairman and Cawood has continued to develop its laboratory capabilities and established its veterinary diagnostics business. Inflexion is one of the UK’s leading independent mid-market private equity houses and works in partnership with its investee companies to support further growth. 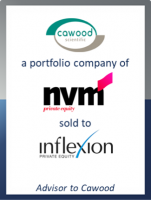 Cawood joins a number of comparable companies in the Inflexion portfolio, including British Engineering Services (an engineering testing, inspection and consultancy firm), Kynetec (a provider of data into the agriculture and animal health markets) and Alcumus (a leading provider of compliance risk management and accreditation services). This represents the latest GCA Altium transaction in the testing, inspection and certification (“TIC”) space following Quadriga’s investment in GBA, the MBO of Stroma supported by LDC and the sale of Scientific Analysis Laboratories to Equistone.